EveryoneSocial is used by companies across a broad array of industries for employee advocacy, social selling, employee engagement, and recruiting. We currently have users in over 60 countries, sharing content in over 70 languages. If social is (or you think it should be) a core part your company’s DNA, then EveryoneSocial can be a great fit. Below is a sampling of current customers, each of which links to an in-depth case study. 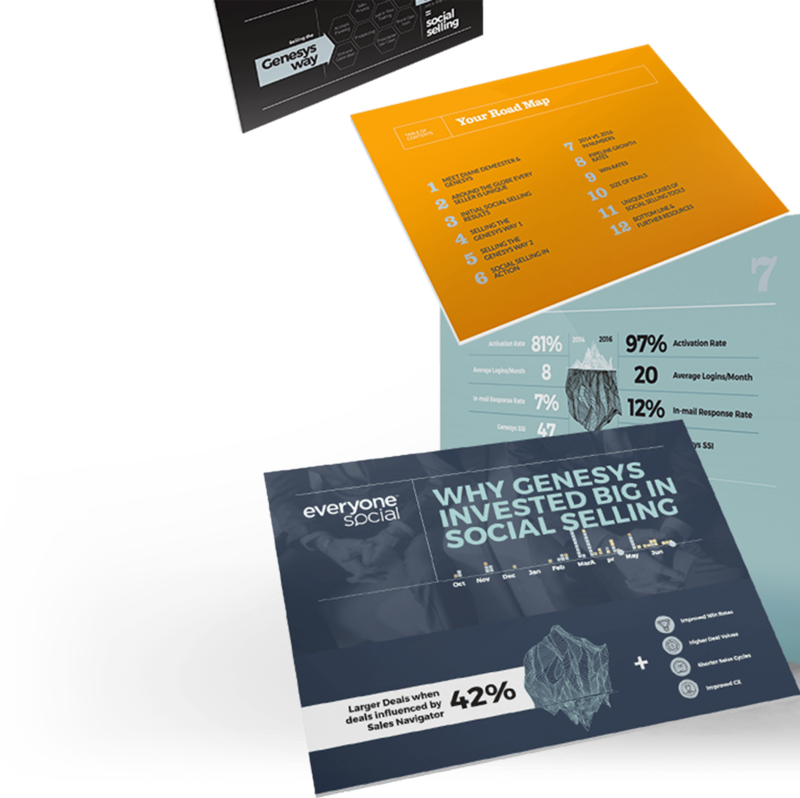 Genesys has shown both how social selling should be done and the lift it can drive. The Genesys social selling program has been in place since the beginning of 2015 and is deployed across their global salesforce. In the fall of 2016 Genesys released the findings of an extensive internal review, which we’ve included in this case study. After analyzing their social selling efforts over an 18mo period, they found that their social sellers outperformed their non-social sellers in all the core KPIs including pipeline, win rate, and deal size. 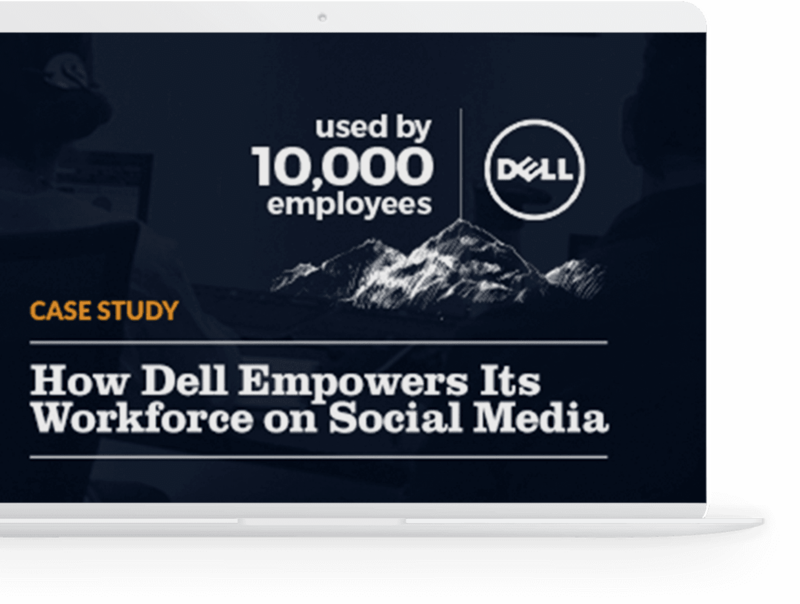 Social media has been a core part of Dell’s DNA for many years. Dell was one of the earliest tech enterprises to market with sentiment analysis and social media monitoring technology. In 2011, when the big social networks were still relatively new, media hubs like Business Insider were already calling Dell one of the world’s most social companies. 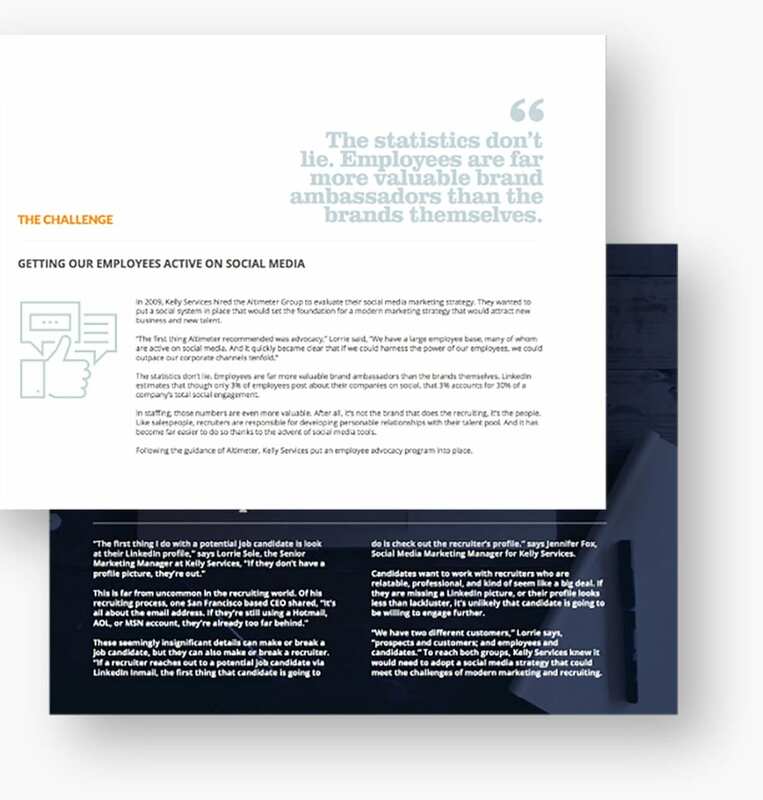 However as time went on and their ambitions grew, it became clear that it needed a structured, centralized program and platform to realize their full social media vision. When Andrew Wilson took the helm as CEO of Electronic Arts in 2013, he set out to focus the organization on three core strategic priorities: putting the player first, focusing on digital transformation in all areas of the business, and working together as one team. With 8,500 employees spread across 30 offices in six different languages, the videogame company was segmented with many different internal cultures that didn’t always collaborate. Not too long ago, a perfectly polished sheet of paper and well-rehearsed hour of conversation was all you needed to apply and be hired for a new job. How times have changed. Candidates want to work with recruiters who are relatable, professional, and connected. If they’re missing a Linkedin profile picture, or their profile looks lackluster, it’s unlikely that a candidate is going to want to engage. This is why employee advocacy is such an important tool for the staffing and recruiting industry and why Kelly Services is a leader in their market. We wanted to build a program that would touch all parts of the globe, uniting all of our teams across studios and locations. Bo Gowan, Head of Social Marketing at Ciena, a leading networking equipment provider was faced with an interesting challenge: Ciena already had a successful employee advocacy program in place with their employees, but could they do the same with their channel partners? Fortunately, the answer was yes, and Bo’s efforts have had a big impact on Ciena’s channel business. 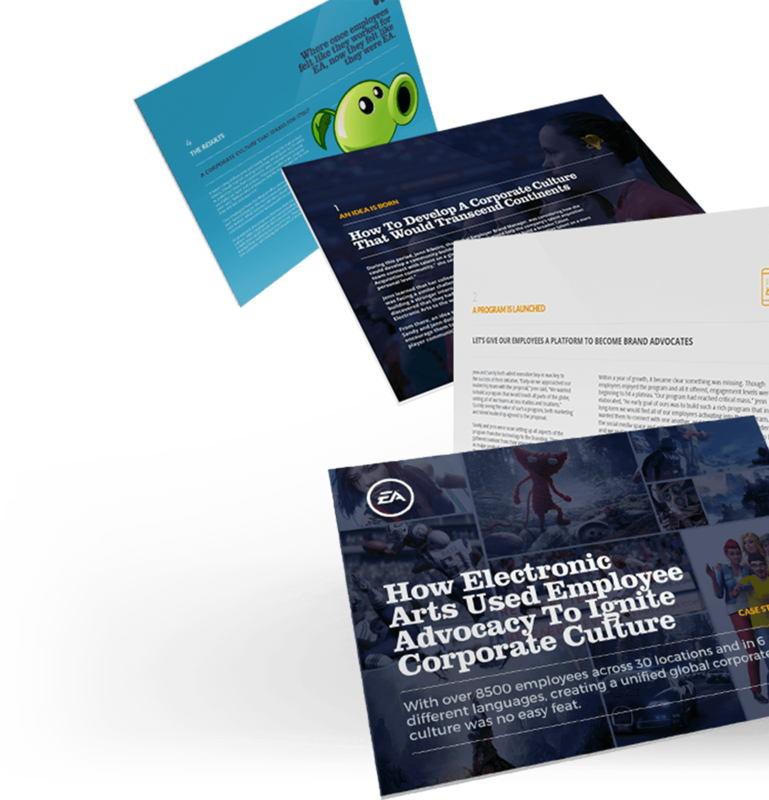 In fact, the program has been so successful that a number of Ciena’s largest channel partners have gone on to launch employee advocacy and social selling programs of their own. 56% of younger employees (Gen Y’ers) said they wouldn’t accept a job unless they had access to social media while at work, and one third said they would prefer access to social media over a higher salary. 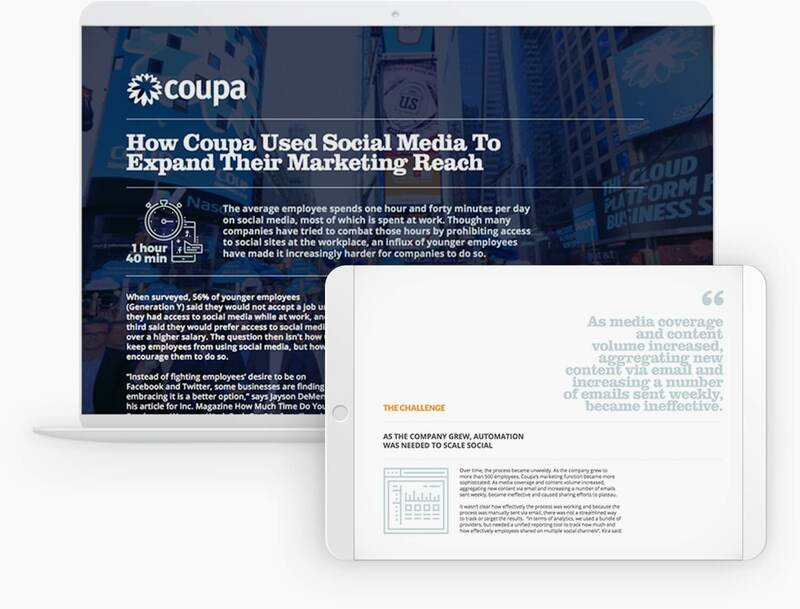 “Instead of fighting employees’ desire to be on social, we’re choosing to embrace it.” said Kira Bernshteyn, Social Media Strategist at Coupa, a newly public software company based in San Francisco. However and as Kira and team soon discovered, realizing the benefits of allowing your employees to use social media professionally requires having the right tools in place.  Live user and admin trainings, account set up, etc.